This remarkable 5 star Cayo Coco Hotel rests on a stunning white sand beach that is gently lapped by crystal clear, warm waters. Enveloped by tranquil gardens and lush green spaces, the impressive Memories Flamenco is the perfect all inclusive resort for families, couples, and singles seeking a deluxe Cuba vacation. 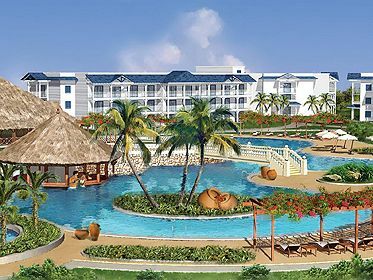 Escape to the tranquil oasis of Cayo Coco and delight in this amazing all inclusive resort in Cuba. An all-suite hotel, guests can enjoy well-appointed and spacious rooms featuring bright and vibrant colours, contemporary design, and traditional touches. With a wide selection of room categories that offer garden, pool, or ocean views, Memories Flamenco ensures a comfortable and relaxing retreat to please all budgets and tastes. Enjoy fun for all ages at Memories Flamenco with an array of exciting activities and entertainment. Spend your day experiencing an assortment of land and water sports, lounge by the dazzling pool, bask on the gorgeous beach, or participate in organized group games and activities. Experience the culture and charm of Cuba with live entertainment and shows, or hideaway in romantic and intimate settings. Children will have the time of their lives at the Kids Club with supervised games and activities. Sumptuous dining options will cater to all culinary pleasures and tastes. From causal open air beach grills to gourmet specialty restaurants, Memories Flamenco allows you to savour a medley of delicious cuisine. Whether you are looking for a relaxing family vacation, an action packed adventure, or a romantic getaway, the all inclusive Memories Flamenco Beach Resort will enchant you in more ways than one and is sure to become a favourite. Memories Flamenco provides deluxe Cuba accommodations in 624 junior suites and suites in a variety of categories to suit all budgets and tastes. Contemporary designs complement the traditional detailing for a wonderful fusion of old and new world styling. Guests will enjoy the well-appointed and spacious rooms, which feature bright and vibrant colours that create a refreshing atmosphere for a revitalizing tropical retreat. Choose from a variety of room categories, each offering supreme comfort with picturesque garden, pool, or ocean views. Memories Flamenco ensures its bright and spacious rooms provide the greatest in comfort and relaxation for those looking for premium Cuba hotel rooms and Cuba hotel suites. Feel all worries melt away from the moment you enter the light and airy rooms and experience Cuba accommodations at their finest. Sample some of the best Cayo Coco restaurants when dining at Memories Flamenco. With a variety of restaurants to choose from, guests can indulge in delicious cuisine and a variety of sumptuous feasts to please all appetites and tastes. Enjoy an elaborate buffet with a cornucopia of savoury choices and elegant a la carte restaurants offering gourmet cuisine. Dine in open-air casual settings to relish the tropical atmosphere and warm climate, or dress up for dinner at one of the specialty restaurants. With so many exceptional options to choose from, the only decision you'll have to make is deciding on which culinary experience to enjoy. We suggest you try them all! Keep your drink topped up all day and night at these exciting Memories Flamenco bars. With so many options to choose from right on your resort, there is no need to search out other Cayo Coco Bars. Travel with the ones you love and create unforgettable memories at Memories Flamenco resort. The large and spacious rooms offer all the amenities and services families need for the ultimate in comfort and relaxation, while the friendly staff will help you enjoy a worry free and fun family vacation in paradise. Experience one of the best Cuba family vacations at Memories Flamenco and share moments that are sure to last a lifetime. Enjoy an array of all inclusive amenities and services at the Memories Flamenco resort for the ultimate in all inclusive Cuba vacations. Delight in a medley of exciting land and water sports as well as fun games, live entertainment, and more! Whether you are looking to fill your days with nonstop action and entertainment, or simply lounge around by the pool or on the beach, the Memories Flamenco resort is the perfect place to be. Indulge in one of the very best vacations in Cuba at the Memories Flamenco and create memories that will last a lifetime. With so much to do at this remarkable resort, you are sure to fill your holiday with a medley of fun experiences and stories to share with friends and family back home. Escape to the Memories Flamenco resort and relish some of the most exciting all inclusive Cuba vacation moments you've always dreamed of. Memories Resorts understand that sometimes guests require a few extras to help make their vacation complete. Thus, in addition to the all inclusive program offered at Memories Flamenco, several other services and features can be enjoyed at an additional cost to make your stay a more enjoyable one.